After reading about how much Elana loves her julienne slicer, I decided that I should give one a try. 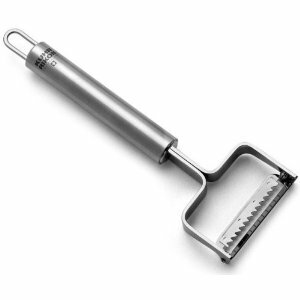 I have a mandolin slicer that I use for uniform, thin sliced potatoes but I don’t love the mandolin and I am generally fearful that one of the kiddos is going to cut themselves with it. Enter the Huhn Rikon julienne slicer that I ordered myself for Mother’s Day. Love it! I have used it to make a few cucumber salads like this one and for carrots (check back later this week for French-Inspired Grated Carrot Salad). I imagine it could also be used to make some cool potatoes that could be fried up rosti-style. I love the idea of vegetables mimicking noodles, not for trickery but for added health and calorie counting. Zucchini can fill in for thin noodles in hot dishes, while julienned cucumbers substitute nicely in cold salads. When fall arrives, I will give Elana’s Chicken “Noodle” Soup a try.